You learned last week that despite seeing, trying, and testing I could not come to like Zoya Aurora. I also said I picked up some other colors from this collection to try. 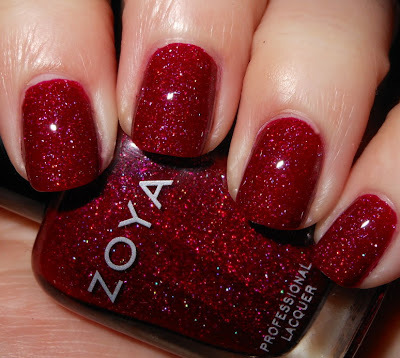 I have Zoya Blaze to show you today. How will I feel about this one? Blaze is a raspberry jelly base with scattered holographic glitter throughout. I like this one guys! This is more my kind of polish. What I like about this one more than Aurora is the base blends with glitters. I also find the glitter is finer, and I like that it peaks through the jelly base rather than how it is overwhelmed in Aurora. I don't want to be negative Nancy, while I do like this polish, it isn't a standout to me. I guess the Zoya Ornate collection and I just don't mesh well, but that's ok! Which polish do you prefer Zoya Blaze or Aurora? Very pretty. I feel like this polish has more depth to it than Aurora did. I'm glad you like this one, cause it's a stunner! I'm so glad you like this one! It's a spectacular red holo and applies super well. I feel the same way as you. My favorite color is burgundy, but I also love most reds. I do like Blaze, but I wasn't overwhelmed with love. I definitely like it a lot better than Aurora. I think this really looks good on you! Girl, you are crazy. Or maybe i'm crazy. Either way. I love both of these polishes! I am in love with this collection! I didn't pick this specific polish up, but I am starting to think I need them all! i love blaze. when i wore it over the holidays i got so many compliments. i also kept staring at my nails. glad you like this one more than auroroa. This is so so gorgeousss ♥.